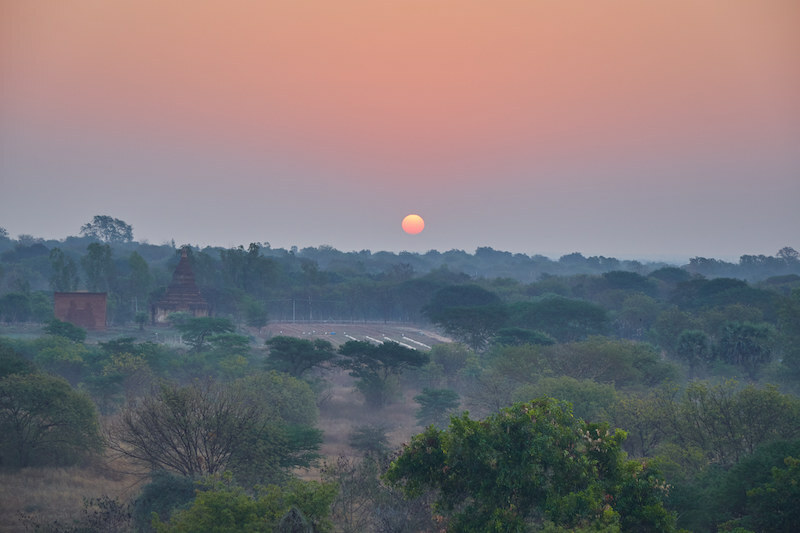 Hot Air Ballooning Over Bagan: Worth It? The image of hot air balloons floating over the ancient, picturesque city of Bagan has become an icon of Myanmar and its tourism industry. 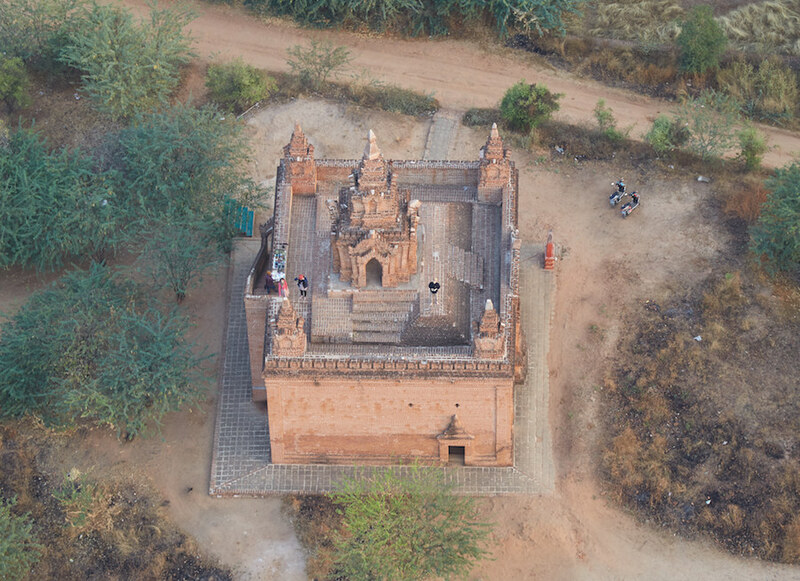 Who wouldn’t want to view Bagan’s unique landscape, with its thousands of ancient temples, from way up in the sky? Many people are shocked, though, when they find out the price. Could a 50 minute experience really be worth $350 USD? 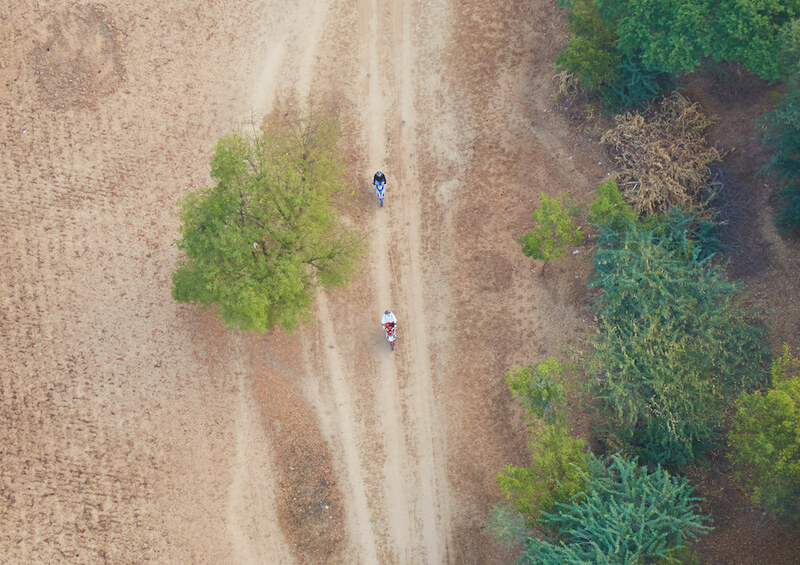 During my time in Bagan, I couldn’t resist going airborne to find out. Before deciding whether or not you want to pay for the hot air balloon ride, you should be aware of how the whole process goes down. As a sunrise balloon ride is the only option, it’s absolutely necessary to wake up very early. Be sure to be ready by 4:30am or so in time for the van that will pick you up and drive you to the site. Before sunrise, you and the other passengers will sit at a long table set up for breakfast. Free coffee and pastries are provided in addition to some fruit. Shortly after breakfast, everyone’s name will be called and you’ll find out which pilot you’ve been assigned to. Now you have a few minutes to relax as you watch the massive balloons get filled up with air. There are currently three different balloon companies operating in Bagan, but the process is pretty much the same for each of them. 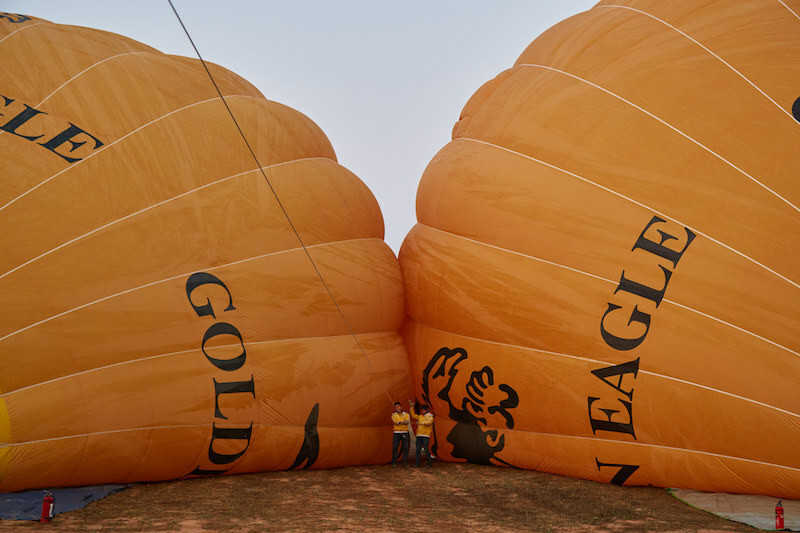 The companies are Oriental Ballooning, Balloons Over Bagan and Golden Eagle. They all charge roughly the same amount and all three are considered to be equal when it comes to quality and safety. After landing, the whole group will be treated to another small meal and some glasses of champagne. You’ll also receive a certificate in case your friends don’t believe you really did it. Before taking a hot air balloon over Bagan, I’d already previously experienced another world famous balloon ride in Cappadocia, Turkey. I have great memories of that ride which, for better or for worse, greatly influenced my expectations before riding over Bagan. While floating over Cappadocia, the other passengers and I got to experience the region’s otherworldly landscape from not just way up on high, but also from pretty far down low. Our pilot took us right through the crevices and cracks of many unique rock formations, and we even hit some tree branches a few times. There were several instances where I was convinced we were about to hit something, but the pilot knew exactly what he was doing. As a photographer, a lot of my favorite shots from the balloon ride over Cappadocia came from when we were floating just above the ground. Thanks to that experience, combined with many of the photographs I saw of Bagan prior to my trip, I imagined something similar before the ride in Bagan. Looking at postcards, it’s easy to get the impression that your balloon will take you right in between the temples, nearly at eye level with some of the bigger ones. Unfortunately, that’s simply not the case, as I would come to discover during the ride itself. Apparently there’s some type of ordinance in place preventing hot air balloons from descending below a certain height. That means you’ll only be getting an aerial, bird’s eye view of the temples below for the entire ride. How, then, do photographers get those shots like the ones on the big posters hanging in your hotel lobby? While I don’t know for sure, it’s likely that they climbed up one of the larger pagodas in the early morning and used a telephoto lens. Or maybe the local tourism board occasionally grants certain balloons special permission to fly low from time to time. In any case, you should be aware that you likely won’t be able to get very low during your ride. A lot of people probably won’t care, but this could potentially be a deal breaker for photographers on a budget. The height issue aside, was this still a great experience with amazing views of Bagan and its surroundings? Absolutely. So. . . Should You Do It? At the end of the day, deciding on whether or not to shell out $350 for a balloon flight over Bagan depends on your budget for your Myanmar trip overall. Are you on a tight budget but fairly flexible with time? Are you forced to make the decision between a hot air balloon ride and an excursion to another part of Myanmar, like Mandalay or Inle Lake? If that’s the case, forget the balloon ride. Though I really enjoyed my balloon ride, I still think that Bagan is best experienced from the ground. The highlight of my trip was riding from temple to temple, never quite knowing what I was going to find. Don’t listen to anyone who says that a hot air balloon ride is absolutely essential to appreciate Bagan. Maybe you don’t have to choose between extending your trip and doing the balloon ride, but still cringe at the thought of paying $350 USD for a 45 minute ride. And you should. There’s no other way to put it – $350 is way overpriced, especially considering you can ride over places like Cappadocia for a lot cheaper. But as long as the 3 companies maintain their monopoly over the experience, you have no choice but to accept their offer. With that in mind, if you can afford it, do it. It’s a lot of money to fork over, especially in a region like Southeast Asia, but months or years later a few hundred dollars is not going to matter much. BALLOON CAPACITY: Typical balloons are limited to just around 12 – 16 passengers. There are also more expensive options available to ride with slightly less people. THE PILOTS: Most, if not all, of the pilots in Myanmar are Westerners. This is likely one of the reasons for the high price. Fortunately, you can rest assured that you’re going to fly with a professionally trained, properly licensed pilot. WHEN TO FLY: The balloon season only lasts from the beginning of October to the end of March. If you’re interested in hot air ballooning over Bagan, be sure to visit Myanmar during one of these months! *Note: Certain details such as pricing and passenger amount may vary slightly from operator to operator or from season to season. If you notice any outdated or incorrect information, please let us know. All three operators offer booking through their web sites. The Bagan area consists of three different towns: Old Bagan, New Bagan and Nyaung U. All three towns are equally convenient when it comes to getting around the Bagan area. 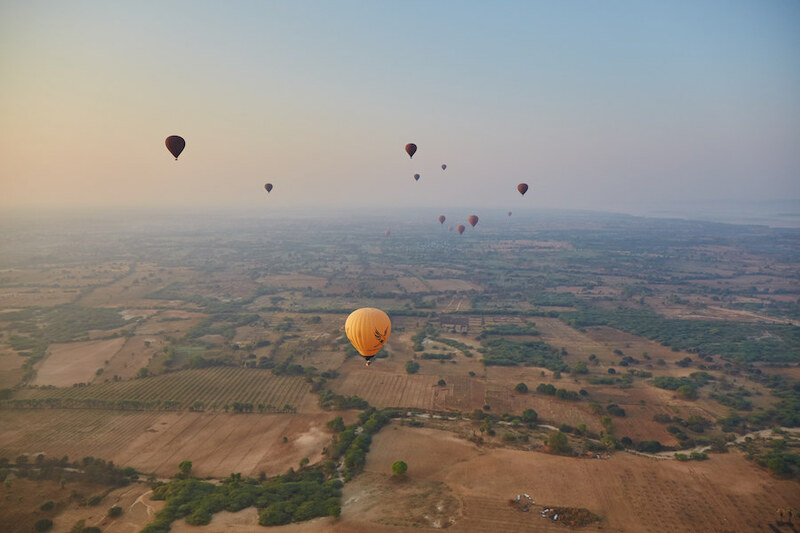 Furthermore, if you want go hot air ballooning over Bagan, the operators should be able to pick you up at your hotel regardless of which town you’re staying in. I stayed in Motel Zein in Nyaung U which was conveniently located and has excellent breakfast buffets. Most people reach Bagan by either a train or bus from Yangon or Mandalay. Taking a boat ride from Mandalay to Bagan (as well as vice versa) is another very popular option. Bagan is also accessible via Nyaung U airport.